L&T Technology Services Limited, a leading global pure-play Engineering R&D Services company is witnessing robust and overwhelming response from the academia and industry communities for its second edition of TECHgium initiative. The ongoing year has already witnessed over 210 institutes registering for the programme collectively numbering to over 10,900 engineering students. Some of the premiere institutes that have already registered for the event include IIT Roorkee, BITS Pilani, VIT University, M. S. Ramaiah Institute of Technology, NIT Kurukshetra & IIT Bhubaneshwar. The increase in participation numbers is noteworthy considering that the rollout of the programme has just been initiated and in the next few months more institutes are expected to enroll. Last year, the number of engineering institutes that participated stood at about 170. The initiative aims at offering young talent a ready platform to work on real-time technology challenges and engineering problems that global businesses face. Engineering students from top tier engineering institutes get an opportunity to work on projects and Proof of Concepts (PoCs) that will address current needs and future challenges of LTTS’ global clientele. The call for submission of concepts has been initiated and the Grand Finale is scheduled to be held in Bangalore on April 13. 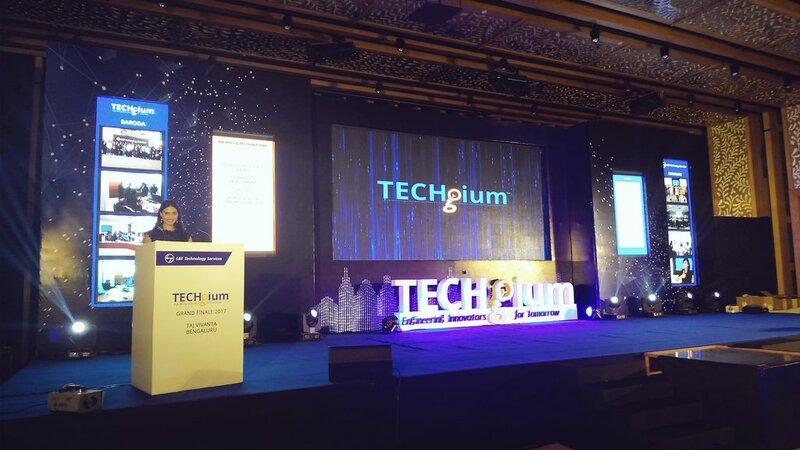 TECHgium finalists will be eligible for employment in L&T Technology Services based on the strength of their concepts and solutions. TECHgium assumes uniqueness in the sense that it helps the nation create new breed of associates with niche engineering skills & capabilities in a way that have simply not been done before. Furthermore, LTTS will help young engineers channel their spirit of curiosity and enquiry and empower them to discover untapped technical skills and innovative approaches to challenges that need engineering-based solutions. Students stand to benefit by gaining invaluable opportunity to LTTS’ solution development team and get recognized as a TECHgium innovator. Successful candidates will be eligible for absorption into the company based on the merit of their solutions. There is also a cash reward for the top innovations developed by students. L&T Technology Services has employed many of the finalists of TECHgium 2016-17 who are now working on innovative customer projects. “TECHgium is the ideal platform for budding engineers to showcase their innovation. Bridging the gap between industry and academia, this is the only platform where students get to work on ongoing challenges and projects in the R&D industry. Besides the mentorship during the course of TECHgium that helps us stay aligned with these industry needs, students get the rich experience of interacting with the best industry experts, scientists and academicians who enlighten us with their rich and diverse knowledge,” said Anirban Gosh, a TECHgium 2016-17 finalist from SRM University, Delhi campus – Batch of 2017. Anirban is now working at LTTS, Vadodara for one a leading Off Highway OEM customer.